As common as Marijuana Crimes are in Michigan, it’s not surprising that more than a few of them are for 2nd Offenses. I was recently asked, in my role as Criminal Defense Lawyer, about the penalties for a Second Offense Possession of Marijuana. And the answer to that question is not as clear as one might first think. In an earlier Blog Post, we learned that Marijuana Possession can be charged as either a violation of a Local Ordinance, or a violation of State Law. 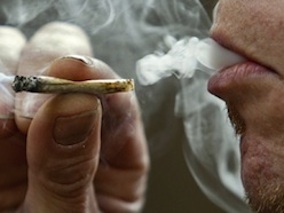 Most local municipalities have a Marijuana Ordinance, and under their terms, Possession of Marijuana is designated as a Misdemeanor, punishable by no more than 93 days in Jail (and, as pointed out in that article, any Jail time, at least in a 1st Offense, is extremely unlikely) and a fine of up to $500 plus Court Costs. In addition, there are Mandatory Driver’s License Sanctions (6 months Suspension of License; a Restricted License for the remaining 5 months may be granted by the Judge handling the case, after the first 30 days of the Suspension have passed) which must be imposed upon conviction. Possession of Marijuana is also a Misdemeanor under State Law, but it is punishable by up to 1 year in Jail, and a fine of up to $2000. In addition, State Law violations also require the same mandatory Driver’s License Sanctions. Those are 1st Offense penalties. For a 2nd Offense, things can either take a turn for the worse, or not. If you think that’s a curious observation, you’re right. The truth of the matter is that what happens to anyone who is busted a 2nd (or even 3rd) time for Marijuana is really a matter of luck. If a person has already been convicted of Possession of Marijuana, and is then charged a 2nd time under State Law, the penalty rises to double that of a first State Law violation. This means a person can be charged with a Felony, punishable by up to 2 years in Jail, a fine of up to $4000, and even more severe License Sanctions (1 year Mandatory License Suspension, with no driving whatsoever for the first 2 months; The Judge handling the case may allow a Restricted License for the remaining 10 months, after the first 60 day Suspension has passed) than those that accompany a 1st Offense. Even if a person has been convicted of Possession of Marijuana once before, and they are subsequently charged under a Local Ordinance, then there is no “Double Penalty” of any kind. That’s why I noted above that whether a case goes one way or another is more a matter of luck than anything else. What results in a person being charged under a Local Ordinance or State Law is generally a matter of either where they were arrested, or by whom. In Municipalities that have a Marijuana Ordinance, most Possession cases will be handled according to it. If a person is arrested is a Municipality that does not have it’s own Marijuana Ordinance, and although not that many, there are a number, even here in the Detroit-area, that do not have such an Ordinance, then the only charge that can be brought is the one under State Law. If a person is arrested by the State Police, then they can count on being charged under State Law. In those cases where the 2nd Offense is brought under State Law, the Prosecutor will almost always charge the person with a “2nd or Subsequent Offense,” thus doubling the potential penalty and jacking the Misdemeanor up to a Felony. For all of that, I have never handled a 2nd Offense Marijuana case where I was not able to have the “2nd Offense Notice” dismissed, and have my Client treated the same way a person would facing a 1st Offense. In other words, the 2nd Offense can almost always be negotiated down to a 1st Offense, which means the Felony is dropped to a Misdemeanor. And of course, that means that the Client is kept out of Jail, as well. The rules governing Driver’s License Sanctions cannot be skirted in the same way. Even if a person is charged with a 2nd Offense, and the Lawyer works out a deal to drop the charge to a 1st Offense, the Judge must impose the more severe 2nd Offense License Sanctions, because doing so is required under Michigan Law. All Drug Crimes are reported to the Secretary of State, and the SOS verifies whether the License Sanction imposed by the Judge complies with State Law. So what are the consequences for a 2nd Offense Possession of Marijuana in Michigan? The most accurate answer is an unqualified “it depends.” As we have seen, any 2nd Offense Charge made under State Law involves the “Double Penalty” which elevates the 1-year Misdemeanor to a 2-year Felony. If the charge is brought under a Local Ordinance, then the prior conviction is essentially not counted, at least until Driver’s License Sanctions are imposed, and the person faces the same 93-day and/or $500 Fine as they would for a 1st Offense. In all of these cases, it must be remembered that whether the person is charged with a 2nd Offense or not, the Judge handling the case will know of their prior Offense. The consequences ramp up accordingly. From a Judge’s point of view, a 2nd timer, whether charged or handled that way or not, is someone who apparently doesn’t follow the rules very well. Even though Jail can be avoided, anyone dealing with a 2nd Offense Charge can expect to be kept on a shorter leash than they were for their 1st Offense.